This issue is the third milestone on the way to the 20th AIDP World Congress dedicated to ‘Criminal Justice and Corporate Business’. It covers the General Report based on all Country Reports submitted for the International Colloquium Section IV at the University of Basel on 2-4 June 2017: The volume contains a special report on Corporate Criminal Responsibility for Human Rights Violations. Jurisdiction and Reparations’ and national reports of Australia, Finland, France, Germany, Italy, the Netherlands, Russia, Switzerland and the United States. It also includes the resolution adopted by the participants of the Basel colloquium. Other national reports (Austria, Brazil, China, Spain, Sweden) that have been submitted for the Section IV are published in the eRIDP. This volume offers a detailed synopsis of jurisdictional problems and possible solutions for viable corporate criminal liability. It illustrates the broad challenges raised by targeting corporations for allegedly causing harm in third countries with regard to territory and sovereignty in the age of globalisation. As the UN Guiding Principles on Business and Human Rights of 2011 oblige countries to establish a legal framework ensuring that corporations respect internationally protected legal interests and basic human rights when doing business abroad, it will have consequences for jurisdictional rules. States shall provide a remedy for victims of alleged human rights violations by corporate groups, as well as crimes alleged to have occurred in their supply chains if certain conditions are met. Of particular interest is the establishment of the link between substantive law and the application of territorial jurisdiction. Also addressed is the need for potential enhancement of traditional jurisdictional rules. Sabine Gless holds a Chair for Criminal Law and Criminal Procedure at the University of Basel (Switzerland). 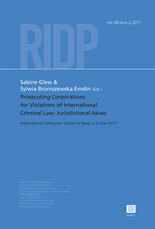 Sylwia Broniszewska-Emdin is a legal counsel and a PhD candidate at the University of Basel, Faculty of Law.